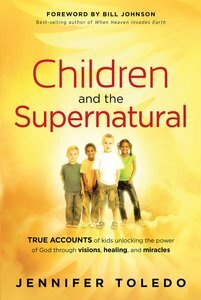 Children and the Supernatural gives the accounts of radical God-encounters experienced by children around the world. These true stories of healings, visions, miracles, prophetic evangelism, marketplace intercession, prophecy, and more will stir you to seek God in a deeper way and infuse you with faith to glorify Him in the world around you. About "Children and the Supernatural"
Customer Reviews For "Children and the Supernatural"
A year ago I searched for a book of testimonies of what God is doing in and through children. Now this year it's been published! Children and the supernatural is such a faith-building encouragement! Two of my daughters actually repented of their sins and became born again after I read this book to them, and they've been seeing angels and hearing God's voice often since. Jennifer Toledo is a woman with a huge heart for children, and this book gives one awesome account after another of the miracles God is doing through His little ones.